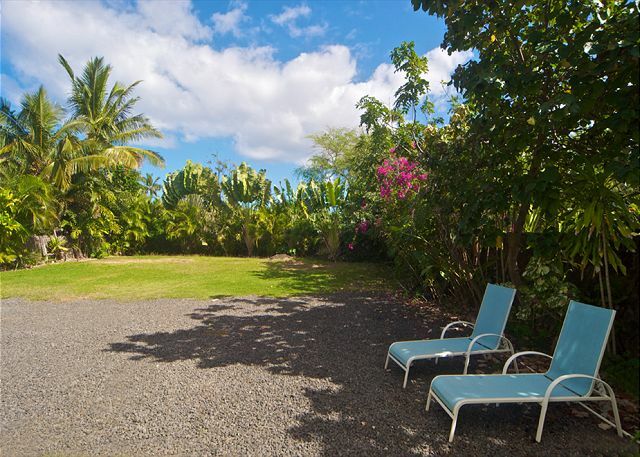 Relax in this spacious, sun-filled property located just steps from spectacular Laniakea Beach. 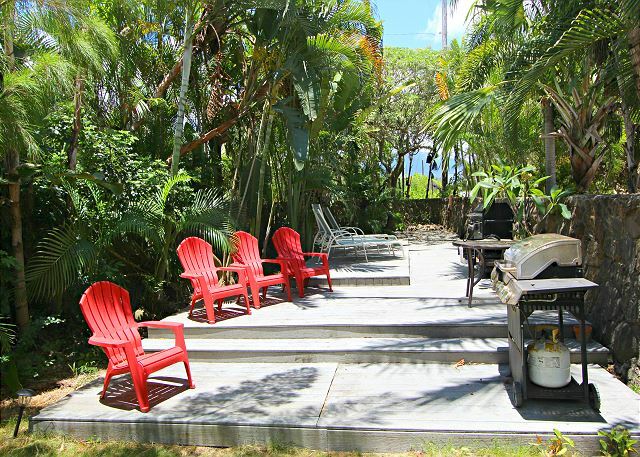 This duplex unit is beautifully decorated in an upscale island style, and is equipped with a/c, internet, shared washer/dryer and bbq, two bedrooms and one bath. 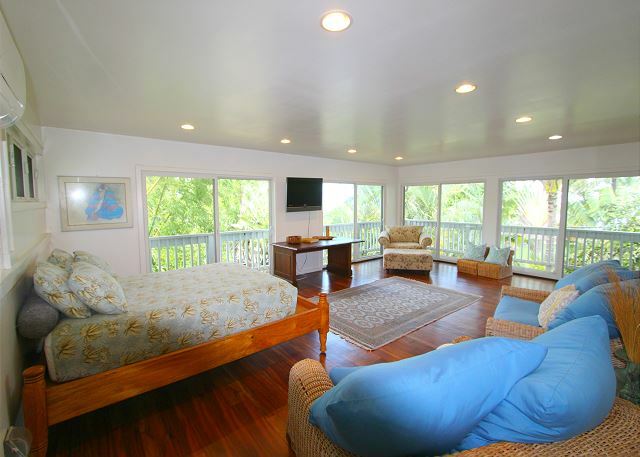 A large enclosed lanai offers guests either a second living room area, or can be used as a fourth bedroom. This unit comprises the entire second floor of the home and has a private entrance, the first floor can also be rented to accommodate large groups. 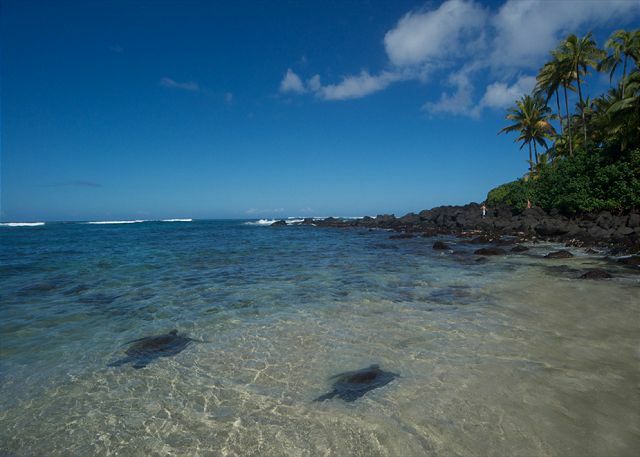 Turtle One is located on the ocean side of the main coastal road, just five steps from the property your toes will be sinking into the soft sand. 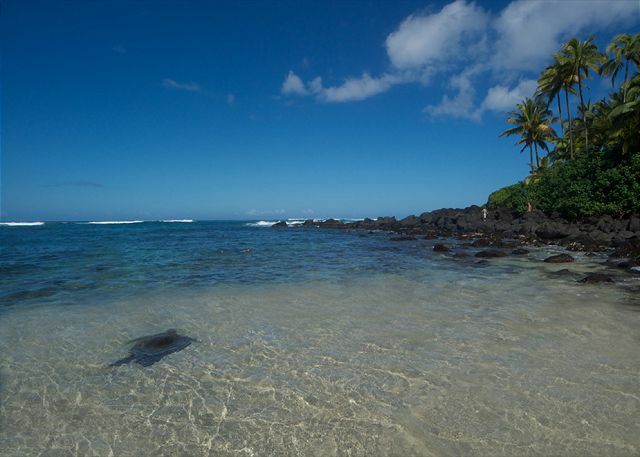 The house is adjacent to Laniakea Beach, famous for sunsets and sea turtles, and in extremely close walking distance to Chun's, another excellent beach for long walks and swimming. 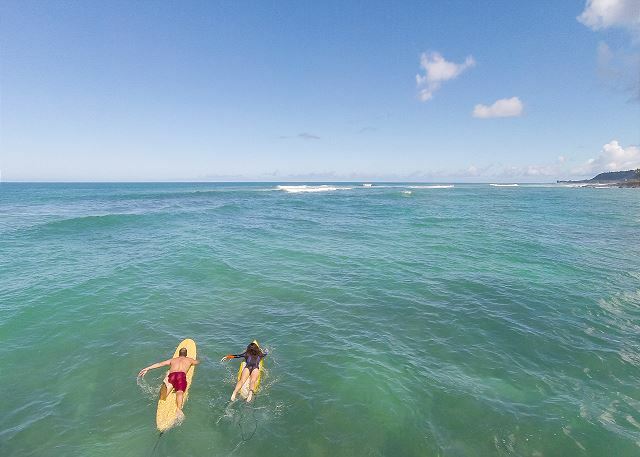 During surf season a number of prime surfing spots are located just in front or to the side of the property - Lani's, Holton's, Jocko's and Chun's Reef. 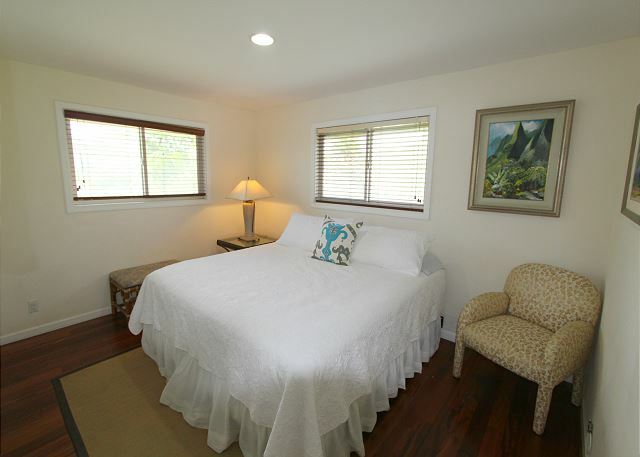 BEDROOMS : You can hike to the waterfall at Waimea Bay just down the road, or bike to the wonderful snorkeling spot at Shark's Cove. 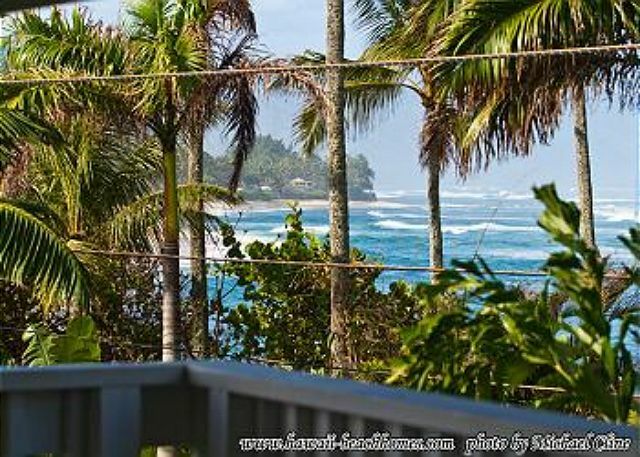 Guests of Turtle Beach House are offered discounts on bicycles, surfboards and stand up paddleboard rentals through Hans Heddemans Surf School, the North Shore's premiere surfing school and rental location. 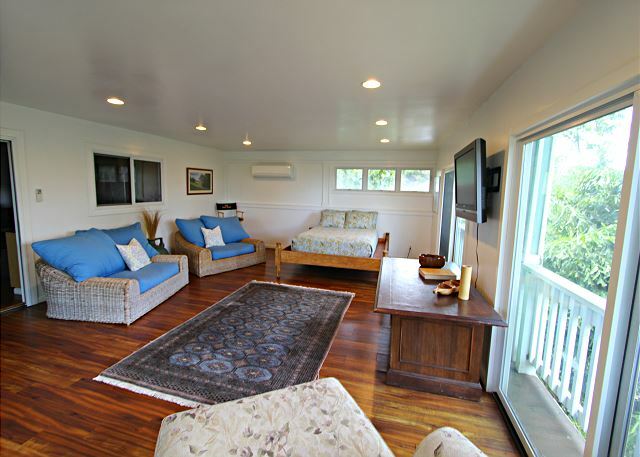 The house is located just two miles from the cafes, restaurants, and shopping in the friendly North Shore community Haleiwa. Other: Please note that Turtle 2 is not directly oceanfront, please see above or give us a call for more information. It is equipped with a kitchenette that has a full size fridge, extra-large toaster/convection oven, microwave, two countertop burners, and ample counter space. It is fully stocked with flatware, utensils and cookware. Pack n plays, cribs and kids beds can be rented and delivered. Very Positive - the house was great - 4 bedrooms, 2 bathrooms - air-conditioned - nice open floor plan. 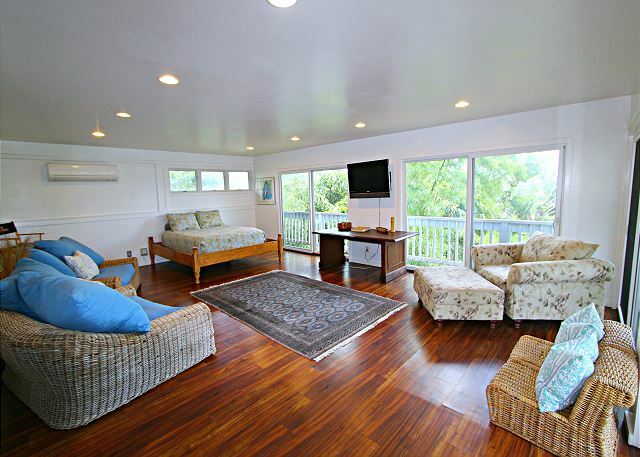 Location was great - close to Haleiwa, away from the busy parts of Oahu, gated parking, close to the beach. It does sit near the Kamehameha Hwy so traffic can be a little noisy in the early morning. 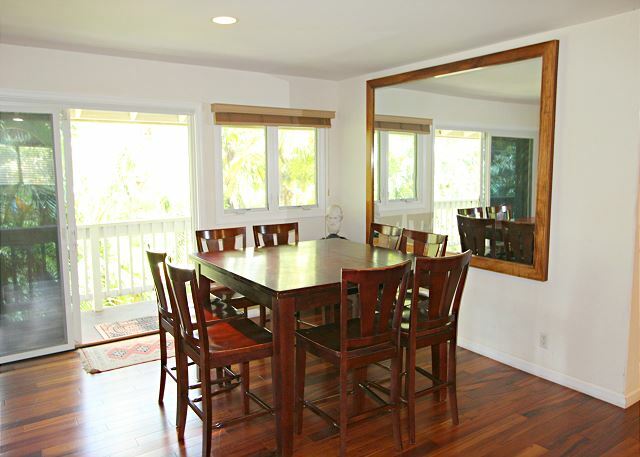 The location is fantastic, and the house is relatively modern. All essentials were provided, and at a superficial level, the house was rather clean. However, we did have a couple of minor incidents. First, an obnoxiously loud (heard through multiple closed doors) air conditioning unit went unfixed for multiple days. A simple dusting of the some of the internal fans made a pretty big difference, but obviously that hadn't been done in many months. Secondly, the security alarm (while unarmed) began consistently chirping at 3 AM due to a low battery in the motion detectors. That took multiple phone calls over the course of an hour to resolve. These aren't the most serious problems one might encounter on vacation, but just the same, they could have easily been avoided. The frustration was multiplied as we were forced to navigate the internal bureaucracy of HBH when seeking help. Divisions between the answering service, the maintenance crew, the owners, and other HBH reps resulted in a lot of finger pointing and unfulfilled promises of call-backs. Overall, we probably would use a similar arrangement in the future - there's just some room left for improvement. Our rental had nice features- good furniture, ample kitchen equipment and utensils, plenty of parking space, good security, and within walking distance to two popular beaches. We had several initial issues, including ants everywhere, no cable, and power out of one area, leaving a smoke alarm in alarm. Most were resolved quickly by management. Air conditioning was good in common areas, but bedrooms were hot. There were two fans, which helped. But there are five bedrooms. A couple bamboo trees had fallen over in the yard, and the continuous traffic nearby was a bit noisy and made for a slow drive in and out. 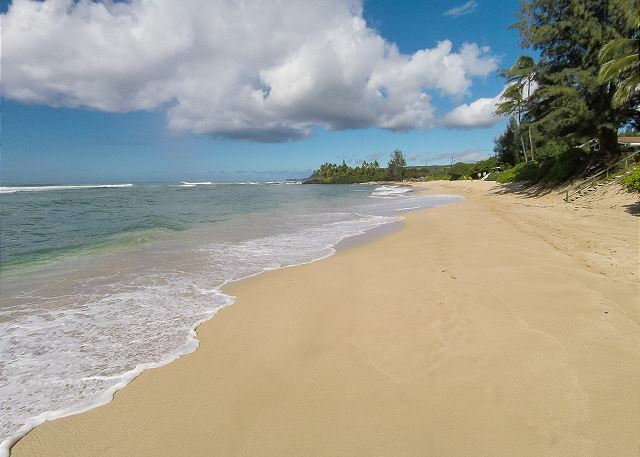 In beautiful Haleiwa, right next to bus stops, walk to two beaches - it was perfect for us! SO glad we stayed here on the North Shore. Turtle 2 was a perfect vacation home for our first trip to the North Shore. It was big enough for the entire family. 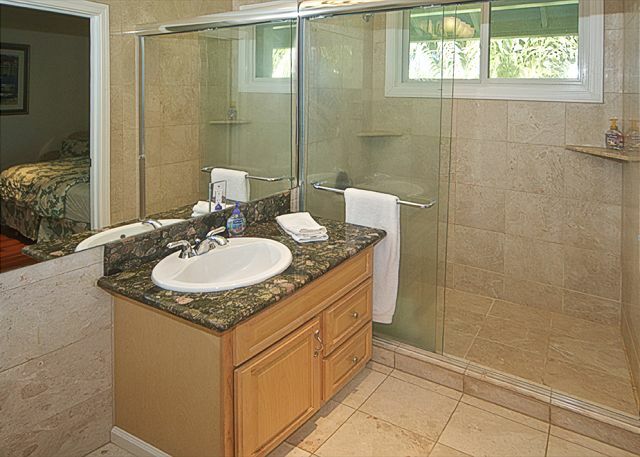 The property was very clean, with plenty of towels for beach and bathing. It was close to everything we wanted to do. The convenience of laundry machines on the property also came in handy. The management made our arrival easy with complete and clear instructions. We will definitely come back. Cafe Haleiwa is a must for breakfast! We had a perfect vacation. Thank you Hawaii Beach Homes!!! We really loved our stay here at Turtle Beach House. Very nice and roomie for my family and I. 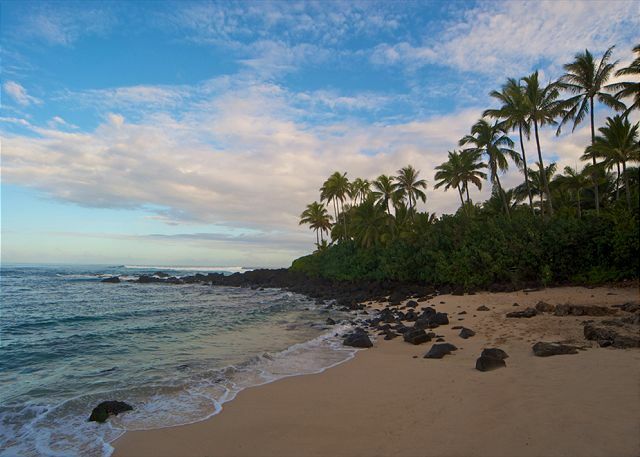 Its in a private neighborhood, but does have very beautiful beaches close by. It is about 45 to 60min away from Honolulu and Waikiki, nut still wouldn't mind the stay again. 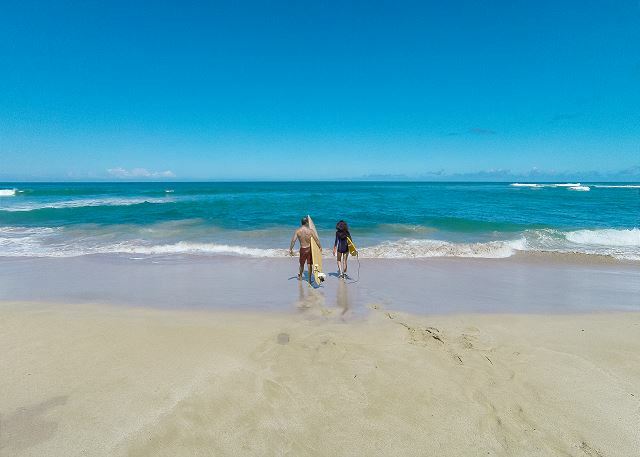 I have been in hawaii four times and this was special because we stay in an amazing house, with an awesome location to surf and enjoy the beach. Beside that, the Hawaii Beach Homes crew gave me all the support that i needed before our trip. And the app is usefull. Thank you very much this experience. Very pleasant accommodations. Wish we could say the same for the weather. Very rainy. It would have been nice to have a side table by the beds. Always like drawers, too. Closet was big and had shelfs for clothes. Kitchen was well stocked. The sun room was used every morning for conversation and coffee. The only difficulty was when we came to check in after have a 6 hour delay with the plane, it was dark (no porch light) and the door code had not been set. After that, things were great. Green turtles swimming and the beach area across the street. The parking area needed more gravel The rain made it quite messy. Perfect North Shore Get Away! We have never been to the North Shore before and we had no idea where to stay. We are so glad we rented this amazing house. We rented the top floor. There was enough room for our family of five. The house provided 4 comfortable beds and air conditioning. It was eclectic and made for the best beach house. We felt safe and the house is gated for privacy and security. We were steps away from 2 different beaches. We had breakfast on the beach and swam with turtles just right outside the house. Everything is close by also. We did not have to drive far to get anywhere. The highway is next to the house and it can be noisy from one of the rooms, but that is to be expected in the North Shore. Most of the homes are off the only Highway. The house has a private road though and we felt very safe. We have no complaints and we are very happy with our decision. We will be back and we will rent the same house. Thank you for sharing your awesome home. Excellent Property! Clean, Very Spacious, Cool A/C in common area only, would definitely stay here again. The beach wasn't crowded and was very close to the house.